What is this a picture of ? At first glance it may appear that this is a picture of a duck looking towards the left, however if you look closely you'll see that the image is also a rabbit looking towards the right. 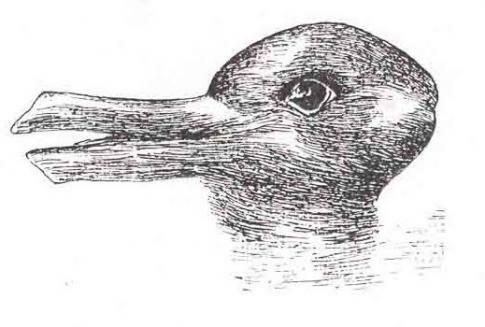 The beak of the duck and the ears of the rabbit are represented by the same part of the image. For the "Duck Rabbit Illusion", I realised that the rabbit's whiskers are gone. Its duck season rabbit season no duck seasong NO RABBIT SEASON!!!! i saw it the moment yhat i looked at it!!!!!!!OMG! that is so freaking awesome AWESOME! Saw that before. Amazed me at first. I can see both !